To be directed by William Jesmond de Clermont. Performance dates. 21 – 24 March 2018 at the Rondo Theatre. At The Drama Hut, Vane Street, Bath, BA2 4DY. 7.30 pm on Thursday 12th October. 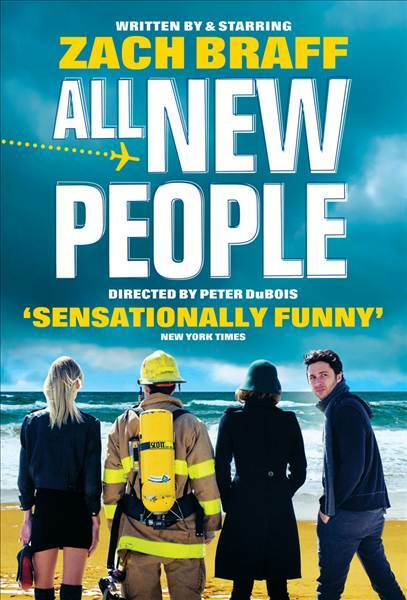 All New People, a play written by Zach Braff and first performed in Manchester in 2012 is about the crossing paths of four young people as one of them, Charlie is about to commit suicide. Together they discover themselves and what makes each other tick as the audience finds out what led each character to that moment in time at the Long Island Beach House. Rehearsals will begin in January, three per week. As this is a small cast production, it is likely that cast will be needed at most rehearsals. American accents will be required, not necessarily region specific, in order to keep as close as possible to the script. This is your only audition preparation. If you are unable to make these audition dates, please contact the director via email - William W. Jesmond de Clermont [[email protected]] or on his mobile - 07539691978. Charlie – Male –25/35 – American. Charlie in a badly timed revelation allowed two planes to crash in his job as an Air Traffic Controller; he decides suicide is the best option and attempts to hang himself while taking time out at his friend’s Long Island Beach House. Building himself up to the intruders in his debacle of a suicide, he tries everything to get them out. Charlie is under a lot of strain with no real means to let go of his actions and nobody to actually turn to. Emma, a Real Estate Agent from England is desperate to get a green card as her visa is expiring. While trying to rent out the Beach House to an elderly couple called the Goldbergs, she discovers Charlie as he is about to end his life and tries to talk sense into him. High on a cocktail of drugs and emotionally scatter-brained, Emma wants any excuse to stay in the US and not marry Myron to do so while escaping her past in England. Myron, a once drama teacher, now firefighter and purveyor of distractions is called in by Emma for a ‘pick-me-up’ and begins calling Charlie out on his lies and what is really going on while fawning over Emma and why she won’t marry him for her green card. A connoisseur of drugs and partying, Myron is ballsy and a very good judge of character. Kim, a high end beauty with a high end price to match is hired by a friend of Charlie to put him in a better mood but is caught up in this gathering of misfits. Slightly dipsy with aspirations for the world of music, Kim is naturally a sweetheart and only wants to enjoy life. We look forward to seeing you at the auditions!